THE bodies of buildings are buried here,” our guide Jaime said, pointing to the partly excavated pyramids at the foot of the great Kukulcán pyramid. One of the seven wonders of the modern world, the limestone structure looms at the centre of the vast public ground in Chichén Itzá, the ancient Mayan city in the heartland of Mexico’s Yucatan peninsula. The steps leading up to the two-storey temple are carved with geometrical precision, but the fearsome sculptures of the god Kukulcán infuse the pyramid with energy and life. Despite the smaller pyramids and other structures along the edges of the grass-covered field, we had eyes only for this one. In the mid-morning sun, with only a handful of tourists to disrupt our reverie, we couldn’t have been the first to imagine ourselves back in the time when this awe-inspiring structure was first built, on the backs of older buildings interred in the ground. For a moment, I wished I were an archaeologist, sent here to discover a whole new city. So much in our world seems documented and studied—what would it feel like to be the first to stumble upon the remnants of an ancient civilization and search for its secrets? It was a feeling that came over me more than once as Jaime led us on a tour of Chichén Itzá, once a powerful Mayan (and later Toltec) centre. For around 3,000 years, the Maya spread over Guatemala, the Honduras, Belize and the Yucatan peninsula. It was only with the Spanish conquest in the 16th century that the Yucatan empire collapsed and the cities were abandoned. The name Chichén Itzá (literally, “at the mouth of the Itzá well”) comes from the Itzá tribe of Mayans who settled here and the natural wells, or cenotes, which supplied its water and formed the religious and cultural centre of Mayan life. 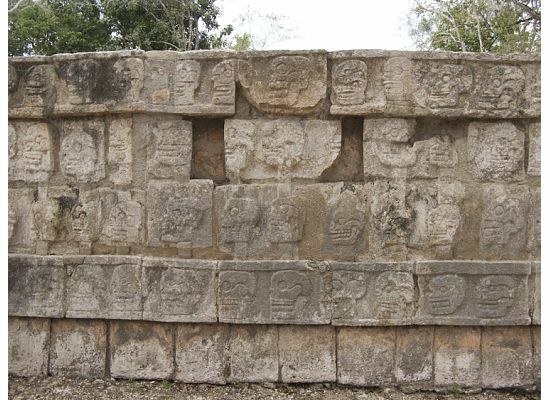 Jaime walked us around the Kukulcán pyramid, named for the plumed serpent god worshipped by the Maya—also known as Quetzalcoatl—whose carvings were everywhere, and slowly, some of its secrets were revealed to us. A feat of acoustical engineering, the pyramid is designed so that a clap from any of its four corners rebounds off the surrounding buildings and echoes all around the ground. A speaker addressing a public meeting would not have needed a mic. But clapping right in front of the stairs produces a different sound altogether, somewhere between the chirping of a bird and a cat whose tail has just been stepped on. That’s because the sound bounces off each individual step before coming back to you. We walked around the pyramid, clapping delightedly. But the pyramid’s marvellous design doesn’t stop there. Twice a year, during the equinox (the next one is on 23 September), a giant serpent emerges at the Kukulcán pyramid of Chichén Itzá: The interplay of sunlight and shadow causes a narrow pattern of light to ascend one face of the pyramid to the top, and then a strip of shade moves down the adjoining face. The light shifts approximately every 4.5 minutes so that, to an observer, it actually looks like a snake slithering up and down the stairs. This phenomenon is visible before sunset for 15 days before the equinox and 15 days after, though never as clearly as on the day. The Maya were also great believers in the importance of celestial precision. The steps on all four sides of the pyramid add up to 365. The nine platforms are bisected by the stairway, which make 18—the number of months in a Mayan calendar. And the 52 different surfaces correspond to the number of years in a Mayan century. 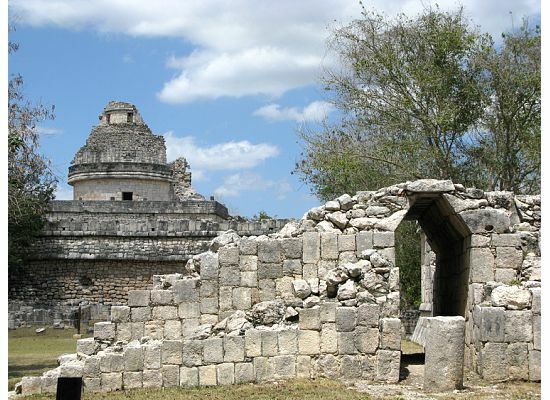 ANOTHER interesting example of their interest in astronomical observation is the observatory, or El Caracol, the only rounded structure in Chichén Itzá. Spanish for snail, El Caracol was named for the interior staircase that spirals upward like a snail’s shell. The windows are thought to facilitate the tracking of the movement of the sun and the moon. It could have been the precursor to the fabulous instruments of Jantar Mantar, Jaipur’s ode to astronomy. The celestial bodies obviously fascinated our ancestors across cultures. For 3 hours, we wandered around the limited spaces open to the public. Only part of the city has been excavated; the digging happens in fits and starts, as and when the government finds money for it. All the private residences are off-limits. If everything were open for viewing, it would cover 2.5 sq. miles. “Not much has changed since the Mayan time,” Jaime told us with a wry smile. “Even then, the most powerful people were the priests, merchants, warriors, wizards and politicians—same as today.” The elite lived in the innermost circle, closest to the public buildings in the town centre. The powerless and the poor were consigned to the farthest reaches of Chichén Itzá—the first to die in an attack. Jaime showed us the older structures, where the architecture and carvings were more ornate, untouched by the later Toltec civilization. We rested near the cenote from whose waters, we were told, human skeletons and other offerings had been removed (from another cenote not far away, a human skull carved out of quartz was unearthed). As we walked down the dusty white roads that connected the different public areas of the city, we got several holas but, surprisingly, a few namastes as well from vendors hawking cheap souvenirs. And we gawked at the giant ball field, the biggest in Mexico, where even the sporting events took on religious significance. In a basketball-like game, two stone rings perpendicular to the ground were fitted into two facing walls; apparently, players attempted to throw the ball through the ring. The teams represented light and shade, and the victory of one over another was an omen for the success of their crops the following year. “Sometimes,” Jaime said, “someone from the losing team was”—and then he drew his finger across his throat in a telling gesture. Fountains of blood arcing from a severed neck are carved in the walls, and where they landed, a new tree flourished in stone. Blood offerings apparently ensure fertility of the earth (references to human sacrifice were everywhere, from the wall of skulls—carved, thankfully, not fossilized—to the various sacrificial sites to the statuary with crevices perfectly sized to hold a human heart). In another spot, we noticed several large, smooth, oblong stones. For years, their purpose remained a mystery. It took a bored young boy to discover that pebbles chucked against the stones produced musical sounds, a total of five different notes. Partly from this discovery, it was surmised that the pyramid where the stones were found must have been used for entertainment (it was also a site for human sacrifice). After a sweaty few hours, we walked back to a cold shower, catching a glimpse of the observatory framed in the arched doorway of our hotel lobby. Slightly indistinct in the glare of the sun, it looked as though we were not only looking at it over a long patch of scrub, but also through time, through a distance of thousands and thousands of years. From the quiet lobby, where we walked across the colourful, hand-painted tile floor, cocooned in delicious shade, Chichén Itzá looked remote, another world in another time. This article was published on 20 August 2010 in the Indian newspaper Mint. Belize is a land smooth and green, like a bedsheet tugged flat, with an embroidery of palm trees that only wrinkle and bump the landscape. When confronted by great white sharks a few feet away from our boat, jaws dropped open and a collective “wow” swept the onlookers. We forgot everything we had seen in scary movies and on Discovery Channel’s Shark Week and just stared. 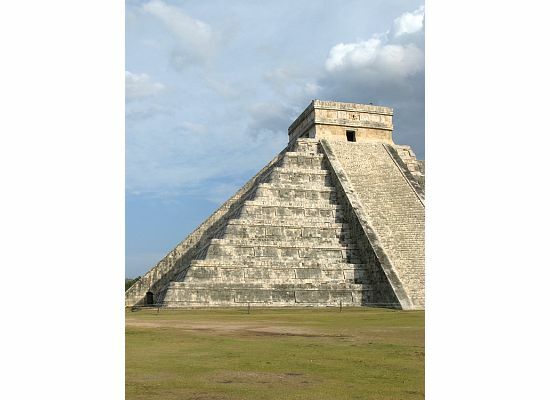 One of the seven wonders of the modern world, the limestone structure that is the Kukulcán pyramid looms at the centre of the vast public ground in Chichén Itzá, the ancient Mayan city in the heartland of Mexico’s Yucatan peninsula. Most rapids seemed to be named after people who had died or were rescued at the last minute from a terrible fate. Maybe someone long ago had thought that it would add to the thrill of rafting down the river, but to me it seemed rather depressing. I shivered in the sunlight. “Cookies for the survivors!” yelled Nelson cheerfully as we climbed up a muddy slope made slippery by the driving tropical rain. It was not the right sentiment to warm the hearts of the dozen or so tourists about to voluntarily zip from treetop to treetop 400ft above the ground.